GL Events Exhibitions: 300 fairs and exhibition rooms across 12 different business sectors. 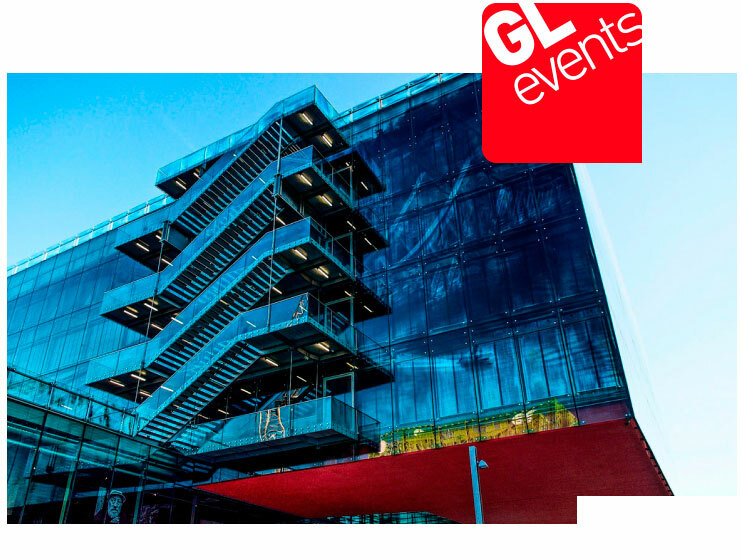 GL Events Venues : 40 managed centres with over 1 million sqm of working space, 4,200 organised events, 30 amphitheatres and auditoriums, and 246 meeting rooms with more than 8 million visitors. GL Events Live: GL Events Live: 4,700 well equipped events, 36 different types of services and over 4 million sqm of fitted carpets. GL Events is active in 5 different continents and is currently working in over 20 countries. 2017 can be summarised using the following statistics: 90 different headquarters, a team of 3,934 employees and a turnover of around €953 million. More than 1.2 million sqm of exposition and event space. More than 4,000 events held. More than 30 amphitheatres and auditoriums and 330 meeting rooms. More than 11 million visitors, spectators and delegations. Large-scale Worldwide Events in which GL Events has participated in 2018.